I’ve written here in the past about how Matlab includes multiple alternatives for color selection, plot-type selection and date selection components, that can easily be integrated in Matlab figures (GUI). 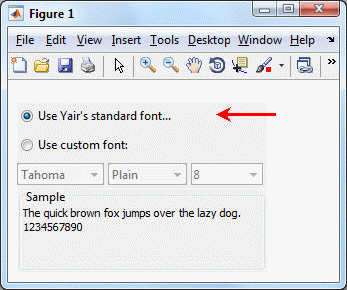 Today, I will show that Matlab also contains various built-in components for font selection. These components are used by Matlab itself, integrated within the Preferences panel, print setup popup, property inspector window and so on. In most cases the components have remained unchanged for multiple releases, some existing in Matlab releases for the past decade or more. 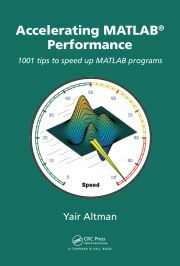 However, since internal components can change without prior notice, there is no assurance that any particular component will continue to be available in future Matlab releases. Readers who are interested in additional details about the components mentioned in today’s post are referred to sections 3.3.3 and 5.5.2 of my book, Undocumented Secrets of MATLAB-Java Programming. The main drawback of uisetfont is the fact that it displays a separate non-resizable modal dialog window. We cannot embed uisetfont within our own panel, integrated in our GUI figure. Using this class is admittedly more cumbersome than DesktopFontPicker and I would not recommend using it in practice. 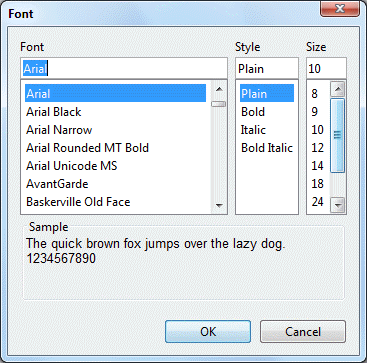 Font selection can also be shown with drop-downs (combo-boxes), rather than with lists as in DesktopFontPicker, FontPrefsPanel, or uisetfont. Use of drop-downs significantly reduces the display “real-estate” required by the control. This is useful in forms where the font selection is only one of several user-configurable options, and where enough space must be reserved for other configuration controls. We can do this using the com.mathworks.widgets.fonts.FontPicker class. 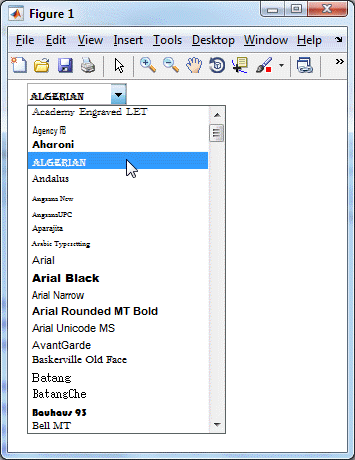 As before, the selected font can be retrieved using jFontPicker.getSelectedFont(). Within the callback function, use getSelectedFont() to retrieve the updated font (again, a java.awt.Font object). There is also a corresponding setSelectedFont(font) to programmatically update the control with the specified Font object. The combo-box presents a FontChooserPanel, which can be accessed (via the PopupPanel property or the corresponding getPopupPanel() method) after it has been initially created. Thereafter, the panel can be customized. For example, the preview text can be modified via the panel’s PreviewText property (or the setPreviewText(text) method). 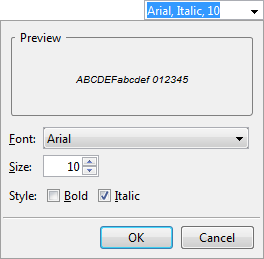 The same FontChooserPanel can also be displayed as a stand-alone font-selection panel, unrelated to any combo-box. Different GUI requirements might prefer using a compact combo-box approach, or the larger stand-alone panel. This combo-box/panel duality is a common feature of JIDE controls. I have previously shown it in my color selection components and date selection components articles. Note that we could also use a listbox uicontrol using the same code. I will be travelling to clients in Austria next week, between October 11-15. If you are in Austria and wish to meet me to discuss how I could bring value to your work, then please email me (altmany at gmail). There is a listfonts command in MATLAB. I guess you can use its output to populate font selection dialog in your application. @Mikhail – read my section on using a uicontrol – this is exactly what I did there. creates a key/value cell array, which can be inserted using colon expansion when font properties need to be specified.